Urethral stricture is a relatively common urologic problem associated with a significant economic burden. The prevalence of urethral stricture is estimated to range from 1 to 9 strictures per 1,000 people. The prevalence is highest and economic impact greatest in developing countries. Risk factors for urethral stricture include advanced age, sexually transmitted illness, socioeconomic status, race, lichen sclerosus, and a history of prostate cancer treatment. Typical presenting symptoms include lower urinary tract symptoms such as weak urinary stream, straining to void, urinary hesitancy, incomplete emptying, nocturia, frequency, and urinary retention. Patients may also present with post-void dribbling, urinary tract infection, genitourinary pain, hematuria, and incontinence. Less typical presentations include urethral cancer, renal failure, urethral abscess, Fournier’s gangrene, ejaculatory dysfunction, or chordee. The differential diagnosis of urethral stricture includes obstructive urethral pathology such as benign prostatic hyperplasia, urethral calculi, urethral cancer, or functional disorders of voiding such as Hinman’s syndrome or neurogenic detrusor dysfunction. Urethral stricture not only adversely impacts patient-reported quality of life but also impacts overall health status. The optimal treatment of urethral stricture from a fiscal standpoint depends on several factors. In non-industrialized nations with a lack of medical infrastructure and expertise, optimizing the use of endoscopic treatment may be the best approach. 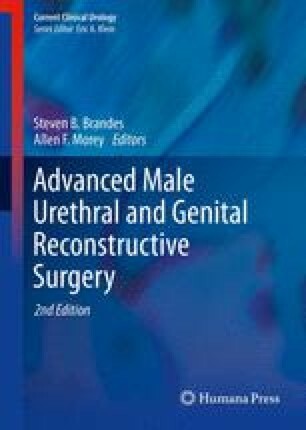 In industrialized countries, proceeding with urethroplasty after one initial attempt at urethrotomy or dilation the most fiscally responsible approach. Patients with a high risk of stricture recurrence after endoscopic treatment should undergo treatment with urethroplasty.